The EduKated Fleas - Ukulele Swing! Looks like March will be a big month for ukes! Come out and listen, play or learn to play! Swing Jam! Sunday, March 10th, 10 am til 1:30 pm. Bank Square Coffeehouse, Main St. Beacon, NY. All instruments and listeners welcome. Ukulele Open Mic! Thursday, March 14th, 7:00 til 9:30 pm. Towne Crier Cafe, 379 Main St., Beacon NY. Sign up in person starting at 5pm. Free! Come and share your love of this amazing little instrument with a community of other like-minded aficionados! Here’s your chance to show off your uke chops, debut a new song, or just take that first step of playing in front of a supportive audience of ukulele fans. Art & Frame opening reception! Saturday, March 16th, 5:00 til 7:00pm, Art & Frame of Newtown, 77 Main Street, Newtown, CT. Come enjoy the art and enjoy the artists' reception for the juried exhibition, "Love"! We'll provide the love songs, plus there will be plenty of wine, snacks and conviviality. Free. Brunch at the Towne Crier! Sunday, March 17th, 11:30 til 2:30pm, Towne Crier Cafe 379 Main St., Beacon NY. Join us for our Ukulele Swing brunch! Since it's St. Paddy's Day, we'll have to bring our green ukuleles! Tasty, toe-tapping tunes and tasty food! No cover charge. Uke from Scratch! The workshop for total beginners, complete with loaner ukes for you to use. At these libraries in March. Contact the libraries to sign up, registration required, all programs are free. Starting soon! Email edukatedfleas@gmail to sign up! We'll work on easy and more complex versions of the tunes, create arrangements for solo or group and add some instrumental chord solos for those who want an extra challenge. Brunch at Note! Sunday, January 6th, 11:30 am til 2:30 pm, Note Kitchen & Bar, 227 Greenwood Ave, Bethel, CT 06801. Bethel's best restaurant -- delicious, innovative food, plus there is always music at Note! Just the thing for a winter weekend. No cover charge. Swing Jam! Sunday, January 13th, 10 am til 1:30 pm. Bank Square Coffeehouse, Main St. Beacon, NY. All instruments and listeners welcome. NEW! Ukulele Open Mic! Thursday, January 17th, 7:00 til 9:30 pm. Towne Crier Cafe, 379 Main St., Beacon NY. Join us at the kick-off and help make this event a regular bimonthly occurrence! Sign up in person starting at 5pm. Come and share your love of this amazing little instrument with a community of other like-minded aficionados! Here’s your chance to show off your uke chops, debut a new song, or just take that first step of playing in front of a supportive audience of ukulele fans. Hosted by Wendy Matthews of the Edukated Fleas, she’ll be keeping an ear out for performers to feature at the next Hudson Valley Ukulele Invitational! Brunch at the Towne Crier! Sunday, January 27th, 11:30 til 2:30 pm. Towne Crier Cafe, 379 Main St., Beacon NY. Come in from the cold and join us for a cozy winter Ukulele Swing brunch! Tasty, toe-tapping tunes and tasty food! No cover charge. 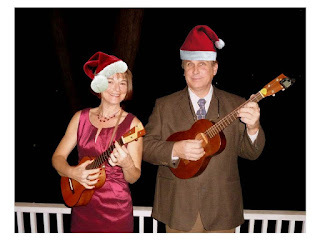 Join us at the Crier for the holiday edition of our Ukulele Swing brunch! Take a break from all the hustle and bustle and enjoy some great food in a great venue, with lots of fun tunes to tap your toes to! Dancing always encouraged as are reservations! Holiday gifts! Now with FREE SHIPPING! Looking for the ideal gift for the ukulele or swing aficionado? Directly from us: use this link: PayPal.Me/edukatedfleas/15 for one CD and PayPal.Me/edukatedfleas/30 for two. You save $3.50! From CD Baby: buy any three CDs (including ours, we hope), get free shipping. It’s also available on CD or MP3 from Amazon… if you order enough CDs or other stuff, shipping is free! Or you can buy it from us in person at our Ho-Ho-Holiday Brunch at the Towne Crier Café on Sunday, December 16th from 11:30 til 2:30! We have Fleabag tote bags too, just the perfect size! Thank you for supporting the Fleas! Second Hudson Valley Ukulele Invitational! Attention ukulele players and enthusiasts! Don’t miss the Second Hudson Valley Ukulele Invitational, hosted by the Edukated Fleas. Come hear a range of ukulele talent from across the tri-state area! Play-alongs too, so DON'T FORGET YOUR UKE! Full bar and the Towne Crier’s great food and fabulous desserts to take advantage of! Suggested donation: $5 to cover our expenses. Come for lunch or brunch and stay for the Invitational! The Fleas will be providing some ukulele swing for your brunching pleasure from 11:30 until 2:15. Join us and ensure you get a great seat for the Invitational. Where to find the Fleas in October! Coffeehouse concert series! Friday, October 12, 7:00 til 8:30 pm, Hall Memorial Library, 93 Main St, Ellington, CT. We're delighted to be part of the library's popular coffeehouse series! Join us, it's free. Swing Jam! Sunday, October 14th, 10 am til 1:30 pm. Bank Square Coffeehouse, Main St. Beacon, NY. All instruments and listeners welcome. Wendy and Greg will join host Uncle Bill Whiskey (AKA Bill Wisnowski) as the special musical guests at Celtic Night! We'll be doing some swingy Fleas tunes and Tin Pan Alley favorites along with Celtic and Americana music! The Abbey has terrific food and drink specials at happy hour prices! No cover, tips appreciated. Fleas in Concert at Croton Library! Friday, October 19, 7:30 til 9:00pm, Croton Free Library, 171 Cleveland Drive, Croton-On-Hudson, NY. This will be a special event in a wonderful theatre with the fabulous Mark Murphy joining us on bass. And it's free! Uke from Scratch! Saturday, October 20th, 3:00 til 4:30 pm, Fairfield LIbrary, 1080 Old Post Road, Fairfield CT. The ukulele workshop for complete beginners! No uke, no problem, we have loaners to share. Free, but registration required. Contact the library to register. Towne Crier Cafe 379 Main St., Beacon NY. Join us for our Ukulele Swing brunch! Tasty, toe-tapping tunes and tasty food! No cover charge. Swing Jam! Sunday, September 9th, 10 am til 1:30 pm. Bank Square Coffeehouse, Main St. Beacon, NY. If the weather is good, we'll be out on the patio! All instruments and listeners welcome. Ukulele send-off for Paul Cundari For those who knew and played with Paul, Georgia is arranging a ukulele send-off for him on Saturday, September 22nd. Please email me if you would like to attend. First Connecticut Ukulele Festival! Saturday, September 29th, 12 noon til 9:30 pm, Suzuki Music School of Westport, 246 Post Road East, Lower Level. Workshops! Including one from the Fleas, plus an open mic and group strums. Plus, evening concert featuring CT performers including the Fleas, Uncle Zac and more, plus headliner Victoria Vox! More info and tickets here. Brunch at Note Kitchen! Sunday, September 30th, 11:30 til 2:30 pm, Note Kitchen & Bar, 227 Greenwood Ave, Bethel, CT 06801. Bethel's best restaurant -- delicious, innovative food, plus there is always music at Note! What could be better? No cover charge. The Second Hudson Valley Ukulele Invitational will take place on Sunday, Nov. 18th from 2:30 til 5:30 pm! Towne Crier Cafe, Beacon NY! Stay tuned for details! Lots of great uke acts, playalongs and more! Dog Days of August with the Fleas! Swing Jam! Sunday, August 12th, 10 am til 1:30 pm. Bank Square Coffeehouse, Main St. Beacon, NY. if the weather is good, we'll be out on the patio! All instruments and listeners welcome. Fluke at Molten Java! Friday, August 17th, 7:30 til 9:30 pm, 213 Greenwood Avenue, Bethel CT. Molten now serves beer and wine, so come join us for a happy Friday libation, a snack and some fun tunes! No cover charge, tips appreciated. Fluke is Julie Sorcek, flute and Wendy Matthews, ukulele. Saturday, August 18, noon until ? Putnam Park, Bethel. Rain date Saturday, August 25. Bring your uke and food and drink to share and join the happening! Brunch at the Towne Crier! Sunday, August 19, 11:30 til 2:30pm, Towne Crier Cafe 379 Main St., Beacon NY. Join us for our Ukulele Swing brunch! Tasty, toe-tapping tunes and tasty food! No cover charge. What: Uke Beginner 1. Join Wendy for a series of three workshops that will get you started with easy chords and progressions. You'll be playing tunes in no time! Cost: $45 for all three classes. To sign up please email Wendy at edukatedfleas@gmail.com! Space is limited.